Sunrise Movement rally in Philadelphia. PHILADELPHIA—The temperature reached a sticky 92 degrees on Wednesday, and hadn’t cooled much by the time the climate action rally started at 5 o’clock. About 50 people gathered in the inner courtyard of City Hall, holding “No Fossil Fuel Money” and “Our Time to Lead” signs. The leaders of the rally, from a youth-led climate group known as the Sunrise Movement, still sported the City Hall visitors stickers they wore to drop off a petition to Mayor Jim Kenney’s office. Roberts, a 2017 Virginia Tech graduate who acted as the rally’s emcee, was one of several Sunrise fellows in attendance. The petition they brought to the Mayor urged him to sign the No Fossil Fuel Money Pledge, a promise to not accept contributions of over $200 from fossil fuel interests. The pledge has over 800 signres at this point, including numerous local, state, and national-level candidates, as well as current office holders such as Bernie Sanders and House members Tulsi Gabbard and Barbara Lee. The Sunrise Movement is a national organization aimed at “building an army of young people” with the goal of stopping climate change. Founded in 2017, they are focused on a grassroots effort to get the fossil fuel money out of politics, through local organizing and supporting candidates committed to the massive shifts required to stave off warming’s worst effects. This particular event was part of #HeatWeek, a set of rallies, sit-ins, and other actions across the country. Along with lawsuits against the federal government and a recent series of youth climate marches, the Sunrise Movement reflects the growing engagement of young people in the climate fight. They didn’t make this mess, but they seem more inclined than anyone else to try and clean it up. And the youth-led climate movement doesn’t seem to care which party it takes aim at. Kenney, a Democrat in a thoroughly blue city, has signed Philadelphia on to a pledge to transition to 100 percent renewable energy, but hasn’t offered a response to the No Fossil Fuel Money Pledge just yet. According to Sunrise’s media liaison, a recent Swarthmore College graduate named Sophia Zaia, Mayor Kenney has not responded to numerous requests for meetings. On Wednesday, Zaia said the door to his office was closed on the group until eventually a representative emerged to listen and accept the petition. Though Sunrise is specifically geared toward climate action, the rallies and events often have a local angle that grounds it more firmly in the community. 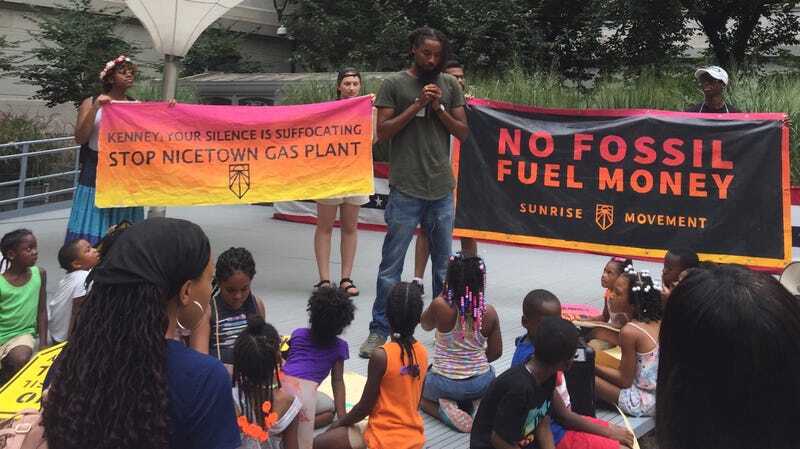 At City Hall, along with the fossil fuel money pledge, the rally-goers were there to oppose a proposed natural gas combined heat and power plant, slated for construction in North Philadelphia’s Nicetown neighborhood. Activists say the plant, which will be built by SEPTA, the Philly transit authority, isn’t necessary and will worsen air quality in the area. Nicetown is a predominantly African-American neighborhood, with asthma rates already well above both city and national averages. SEPTA has claimed the plant will help reduce carbon dioxide emissions by generating their own power for rail and bus needs rather than pulling from the grid, but its local emissions could pose more of a problem. In a May 2017 filing, SEPTA estimated nitrous oxides emissions of almost 22 tons per year for the new project, placing it just shy of a “major” source of this ozone precursor. Ozone can make asthma worse, among other harmful effects. Other local activist groups, including the Center for Returning Citizens and 350 Philadelphia, joined in the rally, and the show was stolen by a crew of adorable preschoolers from a neighborhood adjacent to Nicetown who showed up carrying their own set of clean air-related signs. Zaia, who is originally from Austin, Texas, said she first started learning about climate change as a teenager living through increasingly intense droughts. “I thought, ‘why aren’t more people talking about this?’” she said. At Swarthmore, she joined the fossil fuel divestment movement, and has kept up the fight after college. The group seems unafraid of the fight, no matter how entrenched the opponent. Several Sunrise members were arrested during a sit-in at New York Governor Andrew Cuomo’s office this week, another Democrat who has had trouble distancing himself from fossil fuel money. His opponent in the governor’s race, Cynthia Nixon, has signed the No Fossil Fuel Money pledge. Sunrise has endorsed a range of candidates in the 2018 midterms, as part of “phase 2” of its founding four-year plan. Along with Nixon these include Randy Bryce, running for Paul Ryan’s seat in Wisconsin; Maryland gubernatorial candidate Ben Jealous; and Alexandria Ocasio-Cortez. Dave Levitan is a journalist, and author of the 2017 book Not A Scientist: How politicians mistake, misrepresent, and utterly mangle science. Find him on Twitter and at his website.